Joyce is a midwest girl, she was born in Washington Wisconsin and attended the University of Wisconsin. But you would never guess this from her unusual and interesting paintings. She is enamored with living forms and attempts to explore the body’s direct relationship to itself as a visible form of expression. According to Paul, the body, taken as a visible symphony of nuance, and implication, with gestures grand to barely perceptible, is solely reliant upon the usually nonvisible central computer or brain. Yet this computer can dictate to its host on a conscious, subconscious, or even unconscious state. A simple and basic enough concept, yet utterly staggering in its scope and implications. Much like Walt Whitman’s “Songs” Joyce’s paintings have been called completely absorbed in the celebration and endless fascination of being alive! Joyce exaggerates selected body parts and facial features. She In effect puts a magnifying glass to her subjects. She presents a covert set of physical trappings and cuts through the cover using distortions. Her goal is to supply impetus to the viewer for whimsical mental meanderings. 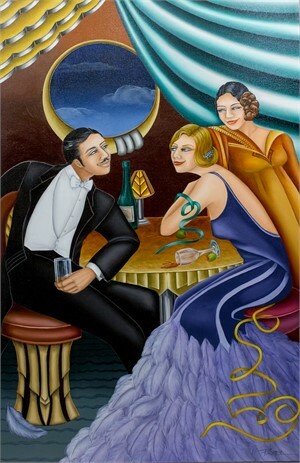 Joyce explores the patterns and colors of the art deco era and often uses unusual skin tones so that her subjects are without race. 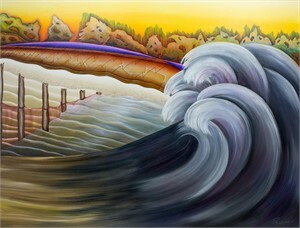 Joyce’s artwork has grace several album covers, and she has been awarded first place prizes in several art competitions throughout the midwest. About: Joyce is a midwest girl, she was born in Washington Wisconsin and attended the University of Wisconsin. 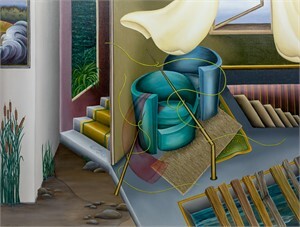 But you would never guess this from her unusual and interesting paintings. She is enamored with living forms and attempts to explore the body’s direct relationship to itself as a visible form of expression. According to Paul, the body, taken as a visible symphony of nuance, and implication, with gestures grand to barely perceptible, is solely reliant upon the usually nonvisible central computer or brain. Yet this computer can dictate to its host on a conscious, subconscious, or even unconscious state. A simple and basic enough concept, yet utterly staggering in its scope and implications. Much like Walt Whitman’s “Songs” Joyce’s paintings have been called completely absorbed in the celebration and endless fascination of being alive! Process: Joyce exaggerates selected body parts and facial features. She In effect puts a magnifying glass to her subjects. She presents a covert set of physical trappings and cuts through the cover using distortions. Her goal is to supply impetus to the viewer for whimsical mental meanderings. 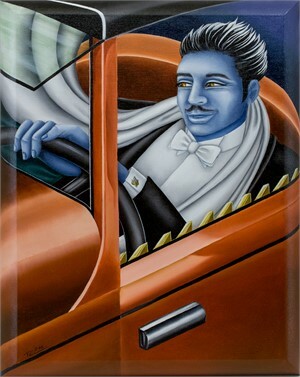 Joyce explores the patterns and colors of the art deco era and often uses unusual skin tones so that her subjects are without race. 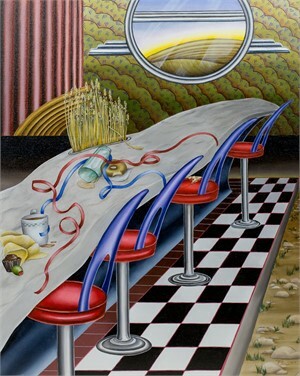 Notables: Joyce’s artwork has grace several album covers, and she has been awarded first place prizes in several art competitions throughout the midwest.